Rainfall can be a risk as much as a relief in fire-damaged areas of California. Earlier this year, at least 21 people died and more than a 100 were injured when heavy rains prompted a mudslide in Montecito after the Thomas Fire. Joshua West, Wilford and Daris Zinsmeyer Early Career Chair in Marine Studies and associate professor of Earth sciences at USC Dornsife, is an expert on debris flow. He explains why mudslides can occur in a burned area and deliver a one-two punch after fires. Why is rain sometimes a threat after a fire? "These fires strip all the vegetation away from steep hillsides. Those steep slopes are left bare, and when it rains, the risk is that you can end up with these terrible mud flows or debris flows. "In the past, most fires in California would happen in summer, and then the rain would come in the fall or winter. Now, with fires continuing into November and December, that rain punch comes much sooner, just as communities are starting to recover from the fires." Is there a certain amount of rainfall that can trigger a mudslide after a fire? "Most important is the rate of rainfall—how much falls and how quickly. One of the big problems that happened last year in Santa Barbara County is that the rains were really intense. A huge amount of rain fell in a short amount of time, and that is the worst possible recipe. "We want the rain in California. We definitely need the water. But there is a risk for these damaged areas. The best scenario is if we get the water, it would come as frequent light rain that is much less likely to cause debris flows than big storms. Unfortunately, that's not our typical weather pattern." Can you describe the science of a mudslide? "The problem after the fires is two-fold. One problem is that when the vegetation burns, it creates this hydrophobic layer in the soil, which repels water. If you've ever run your fingers over leaves before, you may have noticed that they have this waxy feel. During fires, those waxes are released and end up in the soil, where their residues coat soil particles and create this film that repels water. "When it rains, this layer doesn't absorb water like normal soils do. Usually, rain will make the soil wet. But that hydrophobic layer isn't right at the top; it's a few inches below the surface. The rain percolates through until it reaches the hydrophobic layer, and because it cannot penetrate, it starts to accumulate on top of that, making this really soupy mess. It easily slips off steep slopes. "The other problem is that the trees and other vegetation that were holding soil on slopes are lost during fires. On really steep slopes, the soil just slides off the hillsides after the fire, and it builds up in streambeds. 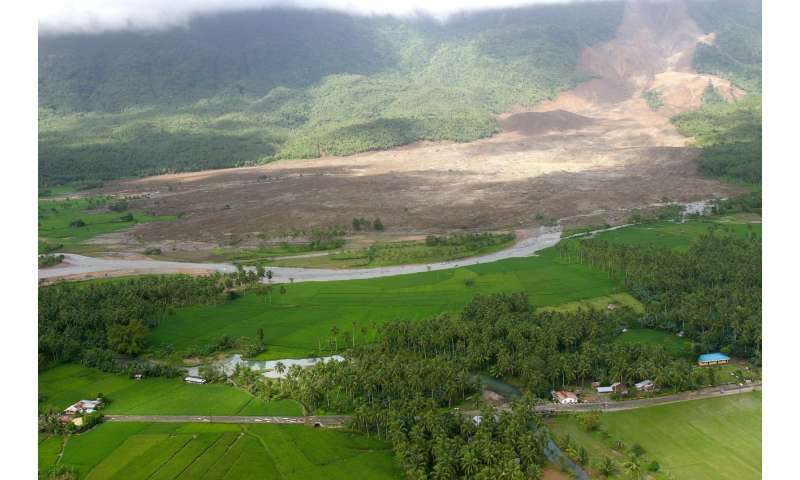 If there is a lot of rain, that can quickly turn into debris flow." Can you predict where mudslides might happen? "We have a long history of fires and debris flows in the Western United States, and we keep learning more about where they're most likely to occur. Some of the important things include the burn intensity, how steep the slopes are and the type of soil. From looking at past fires, you can come up with predictions on where the worst mudflows might occur for a given rainfall. That is why authorities are able to keep an eye on the weather and anticipate what locations are most at risk, so they may issue warnings for vulnerable areas during heavy rains." Can property owners do anything to shore up their homes? "People can put sandbags out and create other barriers to try to divert a potential mudflow. But that does not guarantee that their home will stay safe. When there are evacuations for potential mudslides, they should leave their homes so that they don't become trapped. And it's always smart to have an emergency kit and to discuss preparation with family in advance."